A three-game winning streak appears to be helping the Detroit Red Wings regain the confidence that led them to the top of the NHL standings. The Red Wings seek their fourth straight victory Tuesday night when they host the Central Division rival Chicago Blackhawks. Detroit (45-18-6) has already won the first two contests on its season-high five-game homestand, including a 4-3 victory over Nashville on Sunday. Johan Franzen scored two power-play goals for the Red Wings, who have outscored opponents 12-6 during a three-game streak following a 1-8-2 slide from Feb. 7-29. "A win is a win," coach Mike Babcock said on the Red Wings' official Web site. "We've won three in a row here and it just continues to build confidence. Anytime you have a rough stretch like we had, and then you get your players back, you want to continue to win and just feel good about who you are." The Red Wings received a huge boost Sunday with the return of captain Nicklas Lidstrom, who had two assists after missing the previous six contests with a sprained right MCL suffered Feb. 18 at Colorado. 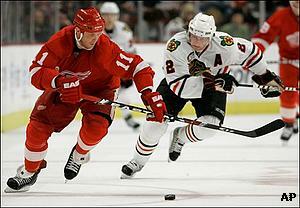 Lidstrom, who has won five of the last six Norris Trophies, continues to lead all NHL defensemen with 59 points. "He makes the game back there look so easy," said defenseman Brad Stuart, who scored his first goal for the Red Wings. "And as a teammate, you see that and it gives you more confidence ... It would take a while to tell all the things he does well." While Lidstrom is back in the lineup, the Red Wings are still without defenseman Chris Chelios (knee) and forwards Daniel Cleary (broken jaw) and Tomas Holmstrom (groin). Holmstrom missed Sunday's game after he was injured during Friday's practice. It is unknown if any of these players will play against Chicago (33-29-7), which is 4-1-0 against the Red Wings this season. Detroit dropped the first four games in the series before posting a 3-1 victory in Chicago on Jan. 6. Goaltender Dominik Hasek, who didn't play in that win, turned aside 20 shots in Sunday's victory. He improved to 8-1-1 with a shutout and a 1.98 goals-against average in his last 10 games. Hasek is 0-2-1 with a 3.27 GAA in three games against Chicago this season, but is 10-7-1 with two ties and a 2.50 GAA in 21 all-time meetings versus his former team. Detroit boasts one of the best home records in the league, but has lost its last two games against Chicago at Joe Louis Arena. The Blackhawks haven't won three straight there since Jan. 13-Nov. 27, 2000. Chicago concluded its three-game homestand with two losses following 6-5 overtime defeat to Edmonton on Sunday. Robert Lang had a goal and two assists for the Blackhawks, who are 10-4-2 since Feb. 7. "It's just weird things happen," Blackhawks coach Denis Savard said. "They capitalized on their chances." Patrick Lalime made 19 saves while starting for the eighth time in nine games in place of No. 1 goaltender Nikolai Khabibulin (back spasms). Lalime, who hasn't faced Detroit this season, is 1-10-0 with a 4.85 GAA in 11 career starts against them. Left wing Patrick Sharp, who scored his team-leading 34th goal Sunday, has five goals and an assist in five contests against Detroit in 2007-08. Sharp's best game this season came in a 5-3 victory at Joe Louis Arena on Nov. 17, when he had a hat trick and an assist.